Joel Seligman will step down as the University of Rochester's president next week, a move that he clearly didn't want to take but decided the University needed. The controversy over sexual harassment accusations against Professor Jaeger was simply too big, and Seligman made his decision even before outside investigators released their report about the University's handling of the case. Seligman's resignation ends a remarkable period for the UR and for the Rochester region. He has been a force like no other local university president in recent memory. In his farewell address last week, Seligman recalled that when he accepted the job at the UR, he said he was "a builder, not a cutter." And in his 12 years in office, he has led the UR in an astonishing period of growth: a $1.353 billion capital campaign, the largest in its history; a 40 percent increase in student enrollment; a 38 percent increase in instructional faculty; and an increase in its long-term investment pool to the highest amount in its history. The Medical Center has undergone major expansion, in health care (not only in the immediate Rochester area but also in the region), education, and research. Twenty-nine major new University and Medical Center facilities have been built, including the expansion of the Eastman Theatre complex, the Saunders Research Building, the Wilmot Cancer Institute, and the Golisano Children's hospital. 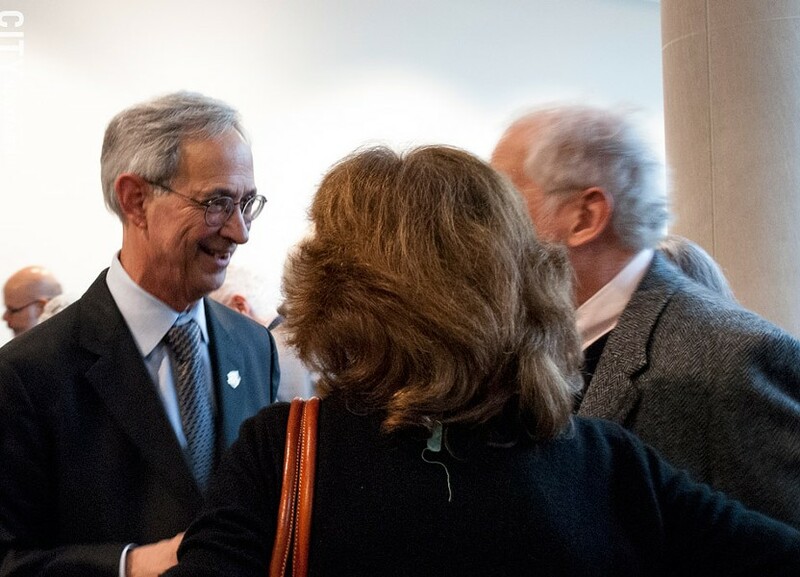 UR President Joel Seligman at a reception at the Memorial Art Gallery following his farewell address last week. The university has embarked on new initiatives in data science and neuromedicine. It has created 19 new majors in arts, science, and engineering. Seligman raised the University's profile, both through its growth and through his own presence in the community. He co-chaired the Finger Lakes Economic Development Council for its first five years – during which time, Rochester was selected as the headquarters site for the AIM Photonics Initiative – and he put the university's resources behind the Council. An avid supporter of the arts, he spurred the creation of Rochester's Fringe Festival, urged that the city be known as "The City of the Arts," and led the university in expanding its performing arts programs. He wasn't afraid to speak out in the midst of controversy, insisting during the tug-of-war over the location of a headquarters office for the Photonics Initiative that it needed to be in downtown Rochester. He built what some might consider to be non-traditional alliances for a UR president. "We always had a very positive relationship, even though SEIU picketed his inauguration" says Bruce Popper, regional vice president of 1199SEIU, whose union members include health-care workers from the University's Medical Center. "He was the first president of the university who understood and respected the mission of our union." "He was a leader on workplace diversity issues," Popper says, and on the need to deal with structural racism. Map designed by Steve Boerner for the University of Rochester and used with permission. During his 12 years as president of the University of Rochester, Joel Seligman oversaw significant expansion of University and Medical Center facilities, shown in red on this map. "I take very seriously community service," he said. "You want a school that not only recognizes its academic role, but that it cannot be remote and separate from the urban area where it is located." He was familiar with Rochester's industrial downturn and its problems when he accepted the job at the University, and he has worked to help the community overcome them. In an address at the Chatterbox Club two years ago, he talked enthusiastically about Rochester's history and its fledgling turnaround. But he also talked about its challenges: the need to help people get training for jobs that will lift them out of poverty, to revitalize impoverished neighborhoods, to "fix the city's broken K-12 education system," and to overcome its "severe and concentrated poverty." "As president of the largest employer in our region," he said, "I pledge the continued commitment of the University of Rochester to help make Rochester the city of which we dream." "We are in this together," he said. Nothing may have better demonstrated Seligman's commitment to the community – and his belief that the university had a responsibility for community service – than his role in forging the UR's partnership with the Rochester school district in managing East High School. And he has been personally involved in the partnership since its creation. In June, the University's Warner School of Education brought urban-education specialist Pedro Noguera to East for a two-day visit and an address at an evening public event. In introducing Noguera that night, Seligman talked about his own involvement with East, which he said had been "a real education" for him. "The issues are complex," Seligman said, "and they're hard." And, he said, while the partnership was completing its second year, "we have many years to go." Despite the difficulty, though, the University wasn't quitting. "We are committed to East High School," he said, "because we are the University of Rochester." At last week's ribbon cutting at High Tech Rochester (now known as NextCorps), Congresswoman Louise Slaughter praised Seligman for helping grow the university and its role in the region. "His caring for this community was profound," Slaughter said. Seligman has faced plenty of challenges during his years at the University. He has twice dealt with cancer: in 2007, when he was treated successfully for non-Hodgkins lymphoma, and in 2014, when a cancer-containing nodule on his lung was removed. Doctors said the cancer had not spread. In 2015, following racist incidents on campus, black students launched protests, demanding that the university handle the concerns of its minority students better. Students cited not only the overtly racist acts but also a greater voice in University affairs, more inclusive curricula, and more student-body, faculty, and staff diversity. The university's efforts with developers in the Brooks Landing area west of the Genesee River have led to new residences and businesses there – and to growing concerns over gentrification by residents of the PLEX neighborhood. And then came the Jaeger controversy, which has led to major protests, a nationwide campaign urging prospective students not to attend the UR, national press coverage, and a lawsuit. "I threw myself body and soul into this job," Seligman said in his farewell address last week, "because I loved the opportunity to serve and the people with whom I worked." But in the end, he lost the trust of many within the University, students and faculty, over the University's handling of sexual misconduct charges against a professor. And on January 11, he announced his resignation. In his farewell address, he noted the University's progress, talked about its future, and talked about the numerous people with whom he has been associated: "scientists, performers, researchers, and scholars," IT staff, administrative assistants, nurses, technicians, janitors. He talked about how much he has loved being president –"the best job in the universe," he said. But in a nearly half-hour address, he scarcely mentioned students. To his critics, the address may have seemed more like a business executive's report to stockholders than a tribute from the head of an institution charged with one of the most important tasks in the country: educating young people. As if students were there to serve the university, rather than the reverse. He referred to the Jaeger controversy only obliquely, urging the creation of "mutual trust and mutual respect," something he said he hopes can occur under new leadership. Whatever the outcome, Seligman's efforts, at the University and in the larger community, won't disappear when he leaves office next week. In the CITY interview shortly after he joined the University, Seligman outlined "five dominant themes" that the UR board of trustees had said they wanted him to focus on: "fundraising, communications, senior leadership and retention, our relationship to the community, and diversity." He fulfilled much of that charge. Now the University's board will look for his successor and, presumably, decide whether the goals they gave him are the goals they still want to pursue. Meantime, UR Professor Richard Feldman, who served as dean of the University's College from 2006 to 2017, will serve as interim president. And Seligman – despite the trauma of the past few months – liked his time at the UR so much that he plans to return to teach after taking a year's sabbatical.